Spandex, Lycra or elastane is a synthetic fiber known for its exceptional elasticity. It is stronger and more durable than natural rubber. It is a polyester-polyurethane copolymer that was invented in 1958 by chemist Joseph Shivers at DuPont's Benger Laboratory in Waynesboro, Virginia. When introduced in 1962, it revolutionized many areas of the clothing industry. The name "spandex" is an anagram of the word "expands". It is the preferred name in North America; in continental Europe it is referred to by variants of "elastane", i.e. élasthanne (France), Elastan (Germany), elastano (Spain), elastam (Italy) and elastaan (Netherlands), and is known in the UK, Ireland, Portugal, Brazil, Argentina, Australia, New Zealand and Israel primarily as Lycra. Brand names for spandex include Lycra (made by Koch subsidiary Invista, previously a part of DuPont), Elaspan (also Invista), Acepora (Taekwang), Creora (Hyosung), INVIYA (Indorama Corporation), ROICA and Dorlastan (Asahi Kasei), Linel (Fillattice), and ESPA (Toyobo). Spandex fibers are produced in four different ways: melt extrusion, reaction spinning, solution dry spinning, and solution wet spinning. All of these methods include the initial step of reacting monomers to produce a prepolymer. Once the prepolymer is formed, it is reacted further in various ways and drawn out to make the fibers. The first step is to produce the prepolymer. This is done by mixing a macroglycol with a diisocyanate monomer. The two compounds are mixed in a reaction vessel to produce a prepolymer. A typical ratio of glycol to diisocyanate is 1:2. The prepolymer is further reacted with an equal amount of diamine. This reaction is known as chain extension reaction. The resulting solution is diluted with a solvent (DMAc) to produce the spinning solution. The solvent helps make the solution thinner and more easily handled, and then it can be pumped into the fiber production cell. The spinning solution is pumped into a cylindrical spinning cell where it is cured and converted into fibers. In this cell, the polymer solution is forced through a metal plate called a spinneret. 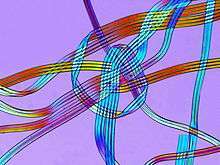 This causes the solution to be aligned in strands of liquid polymer. As the strands pass through the cell, they are heated in the presence of a nitrogen and solvent gas. This process causes the liquid polymer to react chemically and form solid strands. As the fibers exit the cell, an amount of solid strands are bundled together to produce the desired thickness. Each fiber of spandex is made up of many smaller individual fibers that adhere to one another due to the natural stickiness of their surface. The resulting fibers are then treated with a finishing agent which can be magnesium stearate or another polymer. This treatment prevents the fibers' sticking together and aids in textile manufacture. The fibers are then transferred through a series of rollers onto a spool. For clothing, spandex is usually mixed with cotton or polyester, and accounts for a small percentage of the final fabric, which therefore retains most of the look and feel of the other fibers. In North America it is rare in men's clothing, but prevalent in women's. An estimated 80% of clothing sold in the United States contained spandex in 2010. ↑ Marisa Penaloza (2011-12-11). "Spandex Stretches To Meet U.S. Waistlines". NPR. Retrieved 2012-01-17. 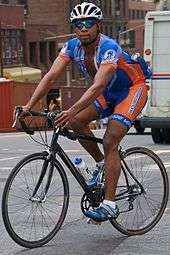 Wikimedia Commons has media related to Spandex.